He’s a plant? So who’s he REALLY working for? The Russians? Are we still blaming the Russians for everything? *checks social media* Looks like it’s still Russians and Trump. And blaming the Russians for Trump and Trump for the Russians. There seems to be a feedback loop going on. Not sure if it’s the same loop the carnivorous Daisies are on, though. WordPress isn’t letting me spam the “like button” today, which is too bad because you guys are really funny today. 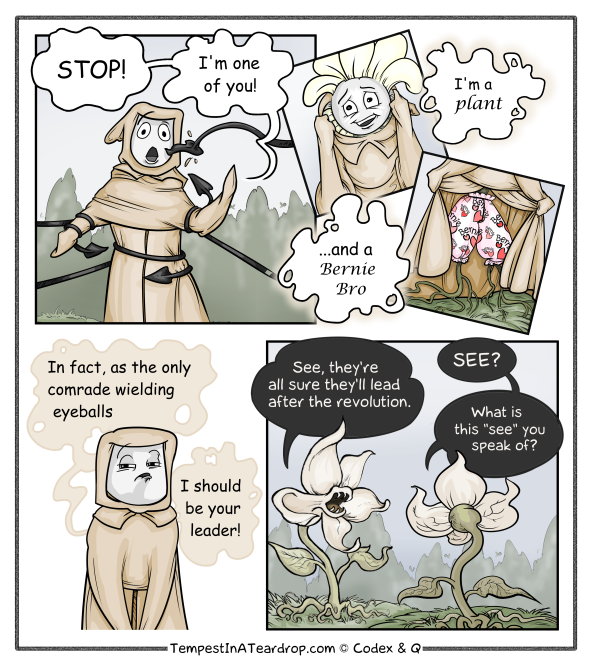 “I’m a plant” is very funny on several levels. It’s the Popular Front for the Liberation of Pansies (PFLP). Bwa! With a side order of wa!ha!ha! A red plant, grown in a communist garden plot, I’m sure.